Why Use Calvert County Roofing Specialists? We stand behind our work, so our top priority is always the customer. You will always get the best materials coupled with honest and diligent hard work. As locals of Calvert County and lovers of Huntingtown, we proudly service the entire Southern Maryland area. As a roofing company in Calvert county we have performed countless roof repairs throughout Southern Maryland and Huntingtown. But we have noticed that there are some more common issues than others. This may be the top reason we get called out. It is one of the easiest problems for home owners to spot. Your roof starts leaking and you don’t know why. A roof leak can be caused by a variety of issues. Improperly installed flashing, or if there is an inadequate moisture barrier below the coping cap along the parapet walls you can often experience leaks with bitumen roofs. Make sure to have a roofing technician come out as soon as possible to take a look at the leak. The longer a leak is allowed to leak, the bigger your problem will become. A thorough roof inspection will be needed to identify the exact cause of the leak. Flashing is material – usually aluminum or galvanized steel – that is installed over joints in the roof to prevent water from seeping in between the joints and causing damage. Homeowners can start seeing leaks if this material is improperly connected or installed, or has aged and needs to be replaced. Shrinkage is caused when the roof membrane (the stuff under the tiles or shingles) shrinks, most often causing cracks in the upper layer. Blistering can occur as a result of poor interply integrity, dry laps, accelerated aging, felt slipping and/or the improper connection of the bituminous roof system resulting from asphalt heated to the wrong temperature. Blistering, ridging, splitting, and surface erosion of shingles can eventually lead to bigger problems. So call roof repair Calvert county to send a technician out before your problem gets any worse. When water accumulates and then sits on your roof it’s always a bad thing. A well-designed roof should never have this problem, but we don’t live in a perfect world and sometimes it can happen just with the natural age and breakdown of an old roof. A roof inspection will first need to be done to identify the exact cause of the problem. Drains could be full, an HVAC unit with no drain line, or it could be something else all together. It’s best to identify the issue before diagnosing it. Tree limbs should always be trimmed back away from your roof as much as possible. Especially on asphalt shingled roofs, hanging tree limbs can rub off the protective layer of the shingles. It is also possible that a branch could break off during the next storm, so it is best to have larger branches removed. Wind and hail damage can cause punctures in roofing material. 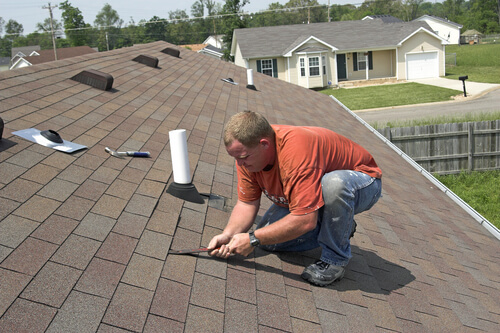 A puncture damages the integrity of the shingles and should be fixed as soon as possible. For example, Calvert county, including Huntingtown has experienced hail storms. It is strongly recommended that you call us after a large hail storm so we can the damage from creating a large problem for you down the road. Many of the issues mentioned above start off as minor. If you have your roof inspected yearly, your Calvert County Roofing company would be able to catch the minor issues before they become major ones. We are your full service roofing contractor for commercial and residential jobs. From repairs to brand new roofs and roof replacements, we can handle it all. Did your roof recently suffer storm damage? Our emergency repair services should be all that you need. We can work with most insurance companies to get your home or building safe again. We work with you and your budget to give you the best new roof you can afford. Storm damage can wreak havoc. We offer worry free repairs as quickly as possible. An immediate and long term roofing solution for commercial roofs. It’s a great question and one that we get asked all the time. What is the square footage of your home? – A 1000 sq ft home compared to a 3500 sq ft home. The amount of time and materials needed will vary based on the answer to this question. How long would you like your roof to last? – Different materials carry longer, or shorter, warranties. What material or roofing product would you like to use? – A home owner that would like asphalt shingles will pay less than a home owner that wants a metal roof. Is this a new roof? Or a roof replacement? – with replacements, we have to factor in tearing off the old roof too. If a roofer tries to quote you a price for your job without asking you the above questions, at minimum, he’s an amateur, if not a joke of a roofing contractor. What else is on the roof? What is your realistic budget? This may seem like a funny question, but it is a real one to consider. Everyone loves a good skylight and chimney and many homeowners have begun investing in solar panels. If you have solar panels or are seriously considering getting them, please let us know. This won’t necessarily limit the type of roof material we recommend to you, but we do need to make sure your roofing is strong enough to handle the panels. You may think you need a new roof if yours has been leaking…. But that’s not necessarily the case. Not all leaks are caused by a damaged shingle. As one of the best roofing companies in calvert county maryland, we would also examine the flashing around your chimney and skylights. We have seen several cases where a homeowner called us saying they needed a new roof. But after coming out for a roof inspection, we’ve happily been able to tell them that to fix the leak in their roof would cost thousands of dollars less than a new roof. To fix the problem, all we needed to do was make repairs to some of the flashing around the chimney or skylights. Many home insurance policies will cover the majority, if not all, the cost of a new roof if there’s been damage. However, we strongly recommend speaking to a representative about your specific coverage to find out exactly what they will cover. If dealing with your insurance company has you anxious, let us know. We would be happy to help walk you through the process and answer any questions you have regarding the best way to go about dealing with an insurance company. Asphalt shingles are by far the most widely used roofing material across the U.S. with Calvert county and Huntingtown as no exception They are an effective waterproof material that can on average last for at least 20 years. The majority of the roofing and roof repair jobs we are called out for involve asphalt shingles. Calvert County Roofing has come to trust these brands after completing new roof installs and countless roof repairs throughout Southern Maryland. These brands are known for both their durability and curb appeal. We would be happy to discuss which brand would work best for you! A solid roof is one of the most important investments you can make. It’s a key component in keeping your home or building structurally sound while maintaining the curb appeal you’re hoping for. Our warranty covers all new roof builds and complete roof replacements. Trust is important when hiring a roofing contractor in Huntingtown and Southern Maryland. Not all companies and contractors are created equal. But as a locally owned and operated Calvert roofing company, we like to treat all our customers with the best neighborly customer service possible. We are your neighbors after all!